Considered by many to be the world's greatest automotive artist, this Latin-American maestro was born May, 1945 in Montevideo, the capital of Uruguay. Alfredo studied architecture at the Facultad de Arquitectura, and painting and sculpture at the Escuela Nacional de Bellas Artes (National School of Fine Arts) in Montevideo. At 21 Alfredo left for Europe, where he settled in Paris for three years. While there he was inspired by classical works of European fine artists like France’s Claude Monet (1840-1926) and Spain’s Joaquin Sorolla (1863-1923). Returning to South America, he accepted a position with an important publishing company in Buenos Aires, the capital of Argentina. He created illustrations for the covers of major Argentinean magazines, including Automundo, Parabrisas, El Tony and D’Artagnan. During this time he became totally involved with automotive art, and in 1989 made the first of many exhibits at the Buenos Aires Classic Cars Club. Painting in oil, watercolor, tempera and pastel, De la Maria developed his distinctive style that falls between realism and impressionism. As a viewer, you can feel the emotion and enthusiasm he puts into every painting. His spectacular motor racing scenes are executed like no other. Full of speed, architectural detail and historical accuracy, they capture the color and excitement of races from around the world. Each one tells its own story, involving animated spectators as well as dashing cars and heroic drivers. 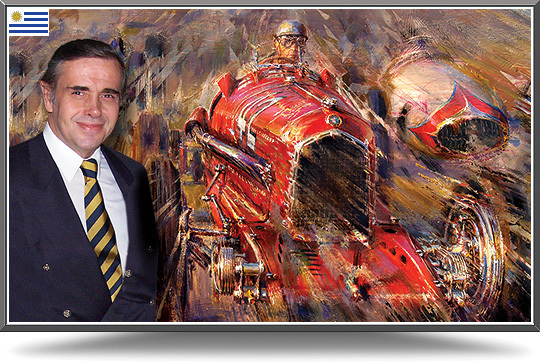 De la Maria’s paintings are exhibited at classic car shows, such as Pebble Beach in California, Retromobile in Paris, France and AutoClásica in San Isidro, Argentina. His art belongs to private collectors and art galleries around the world. Alfredo continues to reside in Argentina, but periodically visits his native Uruguay. Commission Alfredo to create a unique painting for you!